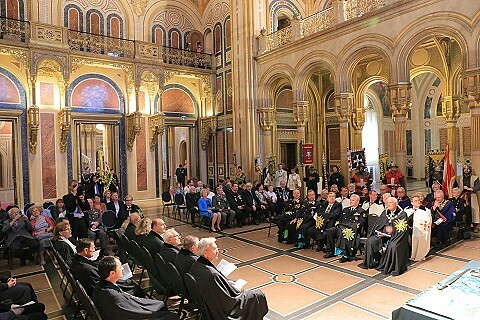 The ceremonial investiture of the Knighthood of Honour took place on April 27th, 2013 in the Austrian Military History Museum-Hall of Fame. 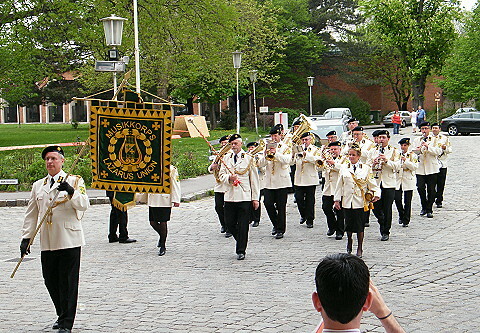 As a prelude the Lazarus Union Music Corps gave an open air concert with a performance of Austrian Traditional Marches, directed by musical director Fritz Lentner. 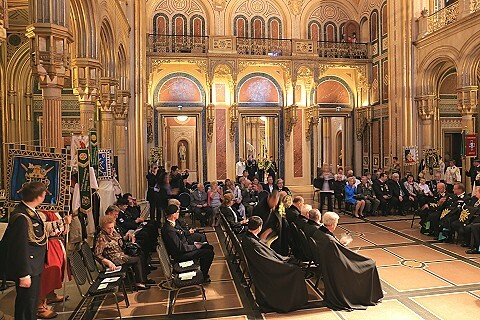 The guests were thus put into the right mood for the upcoming celebration which was also framed by our Music Corps in an excellent fashion. The ceremony itself was commenced by a formal marching in into the hall of fame of the museum, accompanied by the sounds of the CSLI fanfare and march. The Colours detachment was commanded by CSLI Cpt. Gregor Holubek. When all participants had taken their seats, the protocol officer LtCol. Rudolf Murth took over to guide the audience through the various steps of the celebration and provide some additional information. It was a joy to listen to his most professional commentaries. A video documenting the 6th CSLI Air Day gave some insight into the work of the Lazarus Union. 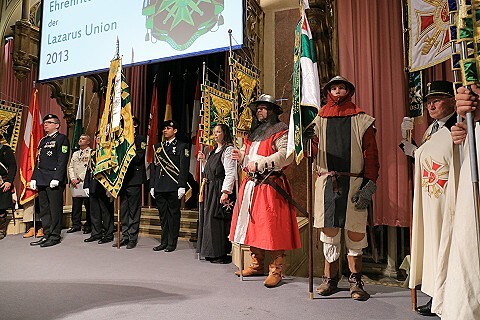 Then the Grand Master of the Knighthood of Honour President Senator h.c. Wolfgang Steinhardt welcomed the guests and gave some explanations regarding the initiation ceremony. Many guests participated, of course a lot of Knights of Honour and CSLI comrades - among them several guests from Germany, not shunning the long journey. Also members and high ranking officers of the Austrian Army participated, as well as detachments from friendly organisations like the Radetzky Order, the Order of St. Michael, the Austria Humanitas Corps, and the Naval Comradeship Archduke Ferdinand Max. 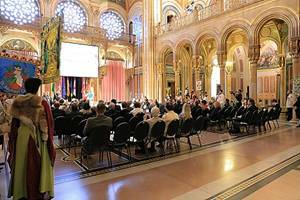 Also representatives of the diplomatic corps and the Austrian Comradeship Union were present. 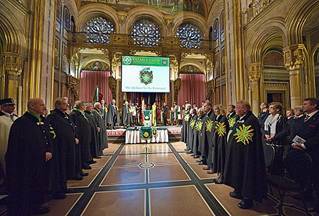 Our special thanks go to the "knights" from Prima Nocte and Milites Sancti Imperii. They carried our banners and flags and provided with their historic clothes a link to the beginning of the former Order of St.Lazarus which recruited its members among the lepers in Outremer, forming the "army of the living dead". 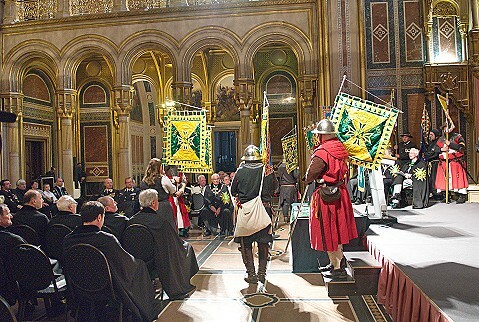 The crusader‘s fanfare led over to the presentation of the banners. Every Knight of Honour is entitled to his own coat of arms and also to present this coat of arms on a banner at official events. At the command: "Banner bearers - step forward!" 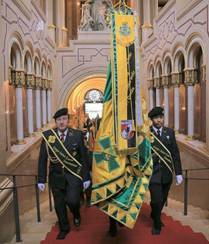 the designated banner bearers step forward and assume the assigned positions. 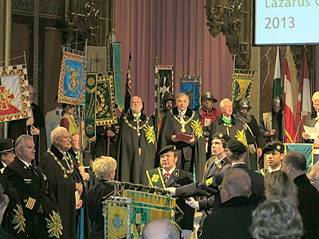 The Grand Master after calling the name hands the banner over to the knight being honoured with the banner. 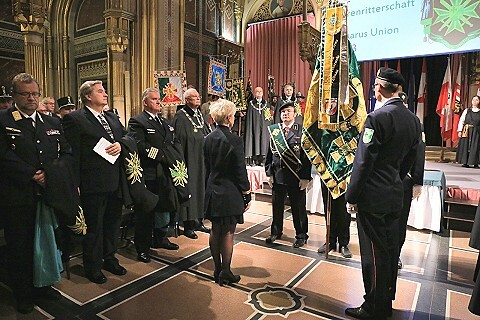 The knight turns towards the audience and greets by lowering the banner. 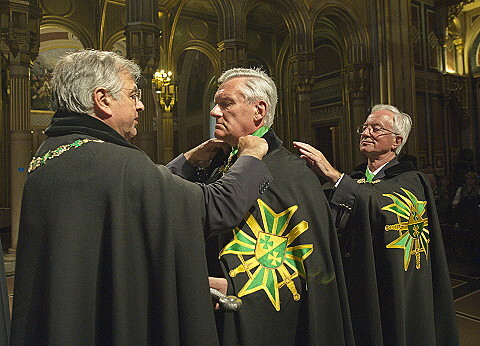 Then the knight returns the banner to the banner bearer. 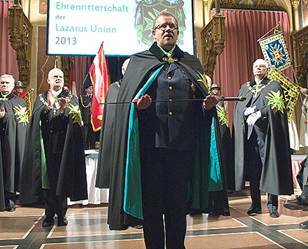 It is tradition in the course of a great investiture that the Lazarus Union officer‘s promise is renewed by all officers present. After the trumpet signal: "Attention" designated officers step forward and put their left hand on the flagpole of the Union flag. The Deputy Federal Commander Wolfgang Leithner states the formal promise and all the Officers present reply. "I promise on my honour..." Personal honour is the most precious thing a Lazarus Union offer possesses. If he breaks this promise he puts disgrace upon himself. 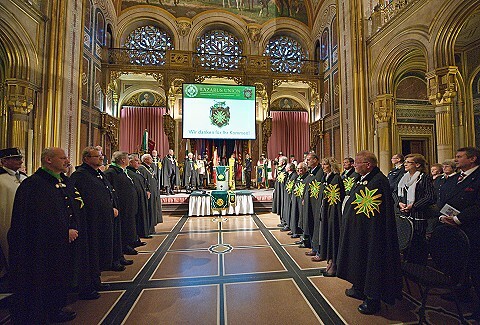 After a speech by the President of the Union - CSLI the actual initiation ceremony takes place. 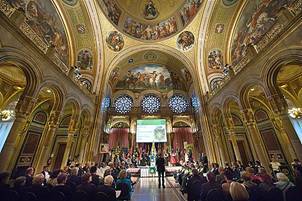 It is a continuation of the old tradition of the accolade. The intention accompanying the ceremony is more important to us than the actual ceremony itself. It claims no authenticity and shall not be compared to other initiation ceremonies. 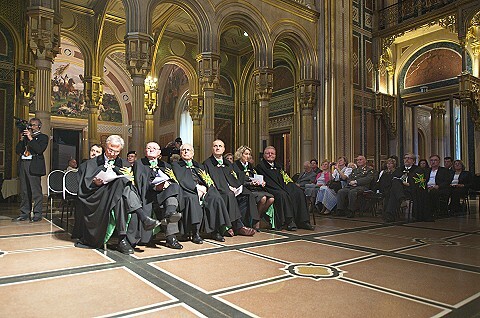 The Presiding Officer then opens the investiture ceremony. The candidates are called by the Grand Marshal and step forward as soon as called. 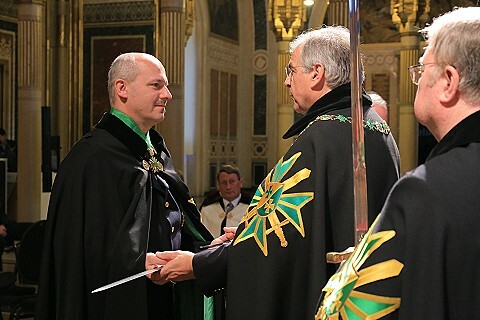 Initiated into the Knighthood of Honour were: Hannes Hochmuth, Dipl.Ing. Herbert Paulis, Dr. Oswin Hochstöger and Sergeant Major Werner Winkelhofer. 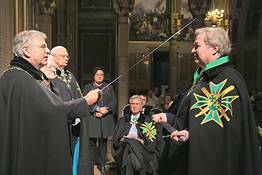 Four more Knights of Honour were initiated by calling their name, their initiation will be made public in the course of the next investiture. 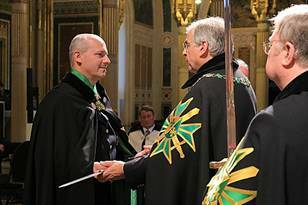 Other personalities and dignitaries were also welcomed and acknowledged in this investiture, as were a number of Confreres and Consoeurs who were duly promoted.